The name Don Scott is likely familiar to those in Columbus and Canton because they both possess airports named after him. However, you might not know the real story about Don Scott, the person. As it turns out, Scott was not only a fighter pilot, he was a terrific football player as well. Donald F. Scott was born on May 4, 1919. He grew up in Canton, Ohio, and began his high school career at Canton Lehman before moving over to Canton McKinley. As an underclassmen, Scott played tackle on both offense and defense as well as handling all kicking duties. As a junior and senior for the Bulldogs, he was the left halfback in head coach John Reed's single-wing offense. He was named as an all-state selection in both years, completing 58% (48-93) of his passes for 991 yards and 11 touchdowns. His rushing yards totaled 657 yards with an astounding 8.8 yards-per-carry average. He went on to be a three-year letter winner at Ohio State, playing for head coach Francis Schmidt. He started at halfback as a sophomore where Schmidt described Scott by saying, "I can't remember a back as dangerous in so many departments of play." 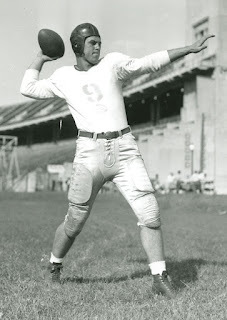 As a junior and senior for the Buckeyes, Scott was the starting quarterback and a two-time All-American selection, leading Ohio State to an outright Western Conference Championship in 1939. He was the ninth overall selection by the Chicago Bears in the 1941 NFL Draft, but would never play for the legendary George Halas. Instead, he'd volunteer his services to the United States Air Force to fight in World War II. As a student, he participated in the Civilian Pilot Training Program, a program sponsored by the Civil Aeronautics Administration to train young men for this type of moment. He successfully completed nine bombing missions on his tour, but it wouldn't be a mission that would take his life. On October 1, 1943, while on a training exercise over England, his B-25 bomber went down and Captain Donald F. Scott perished in the crash. He was just 23 years old and would be buried in his hometown of Canton, Ohio. A week later, his wife gave birth to their son, Donald. Ohio State had built an airport, ironically, to aid their support of the C.P.T.P. 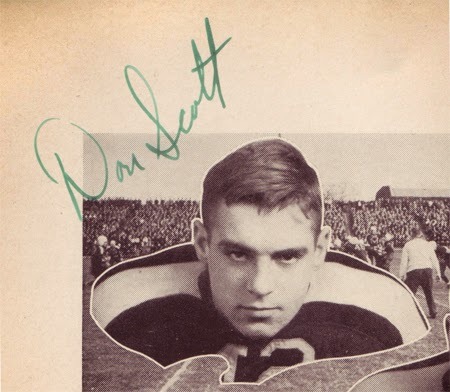 in which Don Scott participated while at OSU. On November 1, 1943, a month after his passing, the University Trustees named the new airport Don Scott Field in honor of their former student-athlete. "He was one of the nation’s great athletes," OSU President Howard Bevis said in the proposed resolution. "He was a sportsman in the finest sense of that term; he was a thorough gentleman, beloved by all who knew him. His life brought great credit to his alma mater. As a fitting commemoration,I desire to propose to this Board that the airfield now owned and operated by the University be designated Don Scott Field." The airport was used by the Navy until the end of World War II, and then OSU transferred its focus to a civilian aviation curriculum. Scott was inducted into Ohio State's Varsity O Hall of Fame in 1988. In 2000, the Columbus Downtown Athletic Club named Don Scott to Ohio State's All Century football team. Although Don Scott lived a short life, he made a lasting impact that is still felt today. Copyright © Smash Through to Victory! From the Roots of Ohio State Football. All Right Reserved.